1. Plotting off-axis angle as a function of time. timedel = data.field('TIMEDEL')     # This is needed to convert to a rate. #         = 0 if n > 10. If the data are essentially background-free (i.e., for a sufficiently short interval), one can run the localization tools gtfindsrc and gttsmap directly on the FT1 file. For longer intervals where the background is significant, we can model the instrumental and celestial backgrounds using diffuse model components. For these data, the integration time is about 1 second so the diffuse and instrumental components will make a negligible contribution to the total counts, so we proceed assuming the background is negligible. We run gtfindsrc first to find the local maximum of the log-likelihood of a point source model as well as an estimate of the error radius. We will use this information to specify the size of the TS map in order to ensure that it contains the error circles we desire. Source '' not found in source model. Since our source model comprises only a point source to represent the signal from the GRB, we do not provide a source model file or a target source name. Similarly, since the exposure map is used for diffuse components, we do not need to provide an unbinned exposure map. Use of a livetime cube will make the point source exposure calculation faster, but for integrations less than 1ks, it is generally not needed. In this subsection, we'll use the same data extracted as for the localization analysis above, but we will treat it as if the residual and diffuse backgrounds need to be modeled. This means that we will include diffuse components in the model definition and that will necessitate the exposure map calculation in order for the code to compute the predicted number of events. We'll see from the fit to the data that these diffuse components do indeed provide a negligible contribution to the overall counts for this burst. We will use the FT1 file, filtered_prompt.fits, from the TS map calculation above. 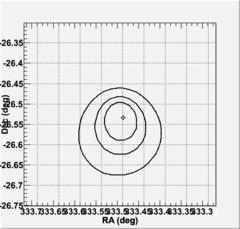 The model will include a point source at the GRB location, an isotropic component (to represent the extragalactic diffuse and/or the residual background) and a Galactic diffuse component that uses the recommend Galactic diffuse model, gll_iem_v02.fit. 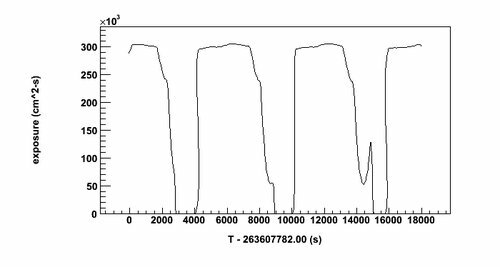 This file is available at the LAT background models page via the FSSC Data Access page. 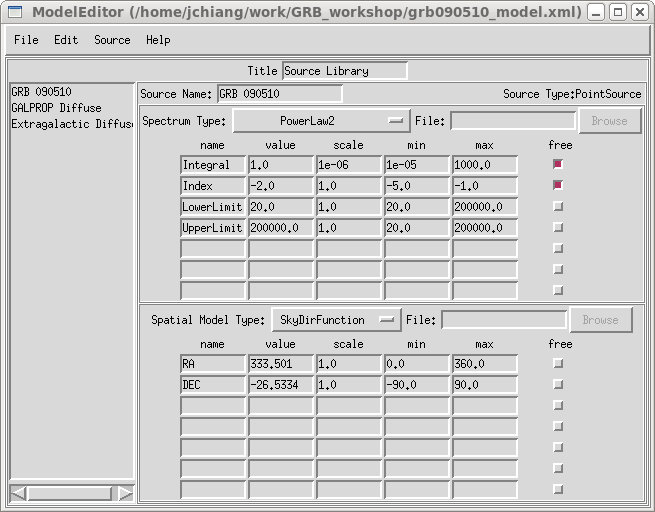 I've edited this file by hand to set the energy bounds for the PowerLaw2 spectrum to be LowerLimit=100 and UpperLimit=10000; this means that the Integral parameter will be in units of 1e-6 ph/cm^2/s over the energy range 0.1—10 GeV. I have also edited the names of the diffuse components slightly. The radius of the source region should be larger than the extraction region in the FT1 data in order to account for PSF tail contributions of sources just outside the extraction region. For energies down to 100 MeV, a 10 degree buffer is recommended; for higher energy lower bounds, e.g., 1 GeV, 5 degrees or less is acceptable. Note that we did not provide an "exposure hypercube" (AKA livetime cube) file. For data durations less than about 1ks, gtexpmap will execute faster doing the time integration over the livetimes in the FT2 file directly. For longer integrations, computing the livetime cube with gtltcube will be faster. When we investigate the extended emission, we will run gtltcube first. Note also that we used P6_V3_TRANSIENT response functions, consistent with our data selection evclsmin=1. 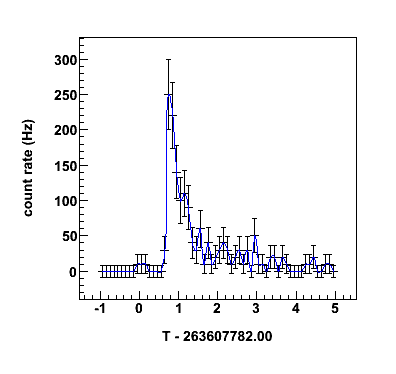 For each diffuse component in the model, the gtdiffrsp tool adds a column that contains the integral over the source extent (for the Galactic and isotropic components this is essentially the entire sky) of the source intensity spatial distribution times the PSF and effective area. 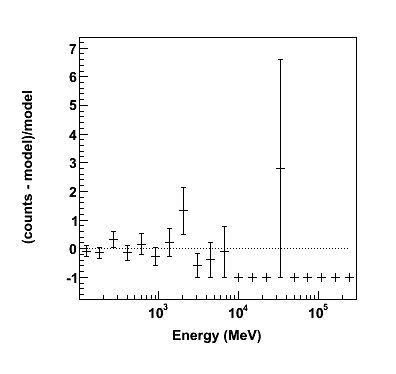 It computes the counts model density of the various diffuse components at each measured photon location, arrival time, and energy, and this information is used in computing the likelihood. This integral is also computed for the point sources in the model, but since those sources are delta-functions in sky position, the spatial part of the integral is trivial. Note that both the xml model definition and optimizer choice can have different values than for the original UnbinnedAnalysis object. Note that certain parameters, e.g., LowerLimit and UpperLimit, always remain fixed. The verbosity flag provides some control over the screen output, with verbosity=0 suppressing as much output as possible. This is the absolute tolerance for changes in the log-likelihood for determining convergence. The default value is 0.001. In the interface, if tol is omitted, the None value indicates that the instance default should be used. Setting it in the function call overrides the default value temporarily for that optimization. optimizer to be used for that function call. Temporary override of the one set when the analysis object was created. Set this to True to have the optimizers provide estimates of the covariance matrix. For large datasets and/or complicated models this can take some time, so it should generally be used only when the covariance matrix is needed for computing errors on fluxes (see below). This allows one to specify an "optimizer object" that can be referenced later outside of this function. Ignore this for now. 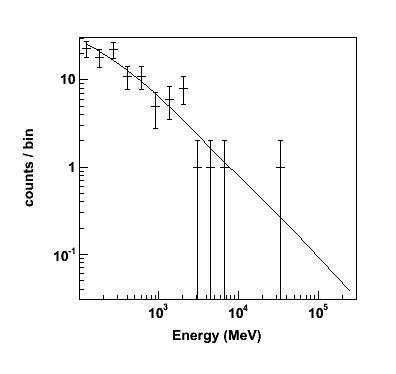 The flux in the 0.1-10 GeV band is 1.85 +/- (0.18) e-2 ph/cm^2/s and the photon index is -1.95 +/- 0.08. This produces two ROOT plotting windows. The plots can be exported as .eps or other image formats. The gtrspgen tool is used to generate the "DRM". Note that one should always use the "PS" response calculation method. Cutoff angle for binning SC pointings (degrees)[60.] 90. For GRB 090510, there really isn't any background contamination. For analyses of longer integrations, one can estimate the background using off-source regions as for more traditional X-ray analyses. ***Warning: No TLMIN keyword value for response matrix FCHAN column. Will assume TLMIN = 1. Chi-Squared =   3.722025e+07 using 20 PHA bins. Current data and model not fit yet. ***Warning: Fit is not current. Warning: Cstat statistic is only valid for Poisson data. C-statistic =       68910.73 using 20 PHA bins and 18 degrees of freedom. C-statistic =          30.31 using 20 PHA bins and 18 degrees of freedom. for data sets with no background files. This prints out the so-called "data sub-space" keywords that record the event selections that have been applied with gtselect. These keywords are propagated to all downstream data products and are used to ensure consistency among files used in a given analysis. The resulting pha2 file, grb090510_rmfit_p2.pha2, and response matrix file, grb090510_rmfit.rsp, can now be read into RMFIT just as with any GBM data. 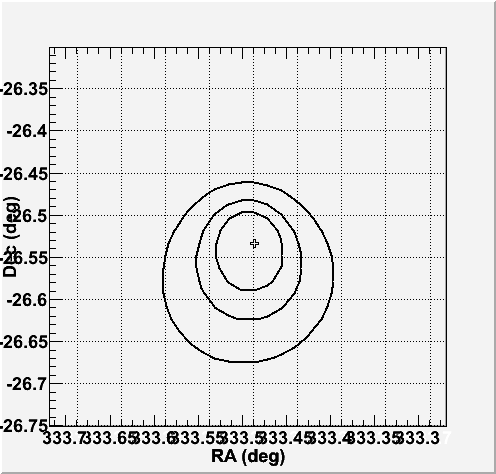 """Angular distance in radians corresponding to a cosinus"""
raise ValueError, "x must be smaller than 1"
"""Angular separation in degrees between two sky coordinates"""
We will compute the light curve using diffuse class events and compute the exposure as a function of time at the ROI center for the given aperture using the gtexposure tool. This will also give us an estimate of the source light curve. Entering zeros for bot the start and end times tells gtselect not to make any time selection. In this case, the time rage of the input data is the original 5 hr + 15 min interval we selected from the FSSC data server. Here we create a counts light curve with 100 s binning. The gtexposure tool adds an EXPOSURE column to the light curve file, given the spacecraft data and specified response functions. The source location is determined from the DSS keywords in the lc_ARR.fits file. 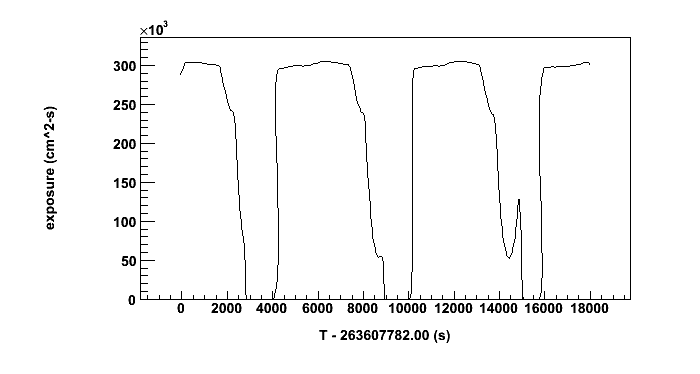 The exposure is computed over the energy range selected for the FT1 file, in this case 0.1-300 GeV. To compute the exposure over a broad energy band, the effective area must be weighted by the assumed spectrum of the source. We can either provide an xml model definition or just give a photon index.